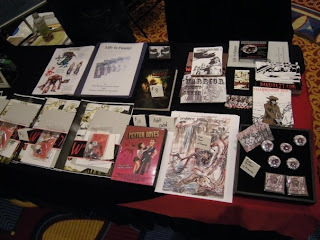 The Small Press Expo was last weekend and Dan and I hit the road for Bethesda. A few months ago, if you had asked us, we weren’t planning on having anything new for the show. But a lot can happen in a few months. 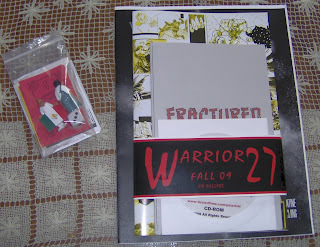 Once we started talking about doing a new issue of WARRIOR27, it turned out we would have the craziest and biggest issue yet for SPX 2009. As usual, we wanted to have a variety of stuff for the anthology. Little did we know. Our friend Matt Constantine, who put us up for the weekend at his place in Fairfax and with whom we had worked before (he has a short prose piece in our second issue from 2006, which was our first year at the Expo) also contributed to this issue. In the end, we went with a multimedia extravaganza of different pieces for this issue. Dan wrote three short stories illustrated by three very different artists and put them into a standard size comic. I contributed a short prose story, “Fractured,” which was in a smaller chapbook. Dan and Travis Dandro (who created the freaky and sometimes disturbing comic Mr. Gnu) created a mini-comic that folds open telling a story from “the mall” and which has, on the back once it’s completely open, a game board wherein one must make it through the mall with money left. 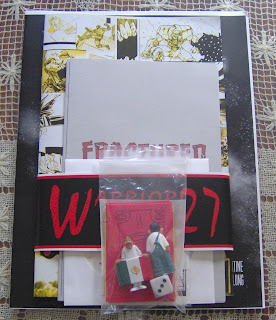 The mini-comic went into a small baggie, while a die, money, and two Homies (playing pieces) went into another baggie, which when stapled to the first rested nicely over our issue wrap. We also had a CD-ROM of a color comic done by Matt and Paul Petzrick and a b/w preview of a webcomic, also written by Matt with art from S.A. McClung. It was a load of stuff in various formats, all for $6 (or $5 on Sunday). It’s a pretty fun bundle, and the Homies pulled people in. Overall, the show this year was better than last year. There were a lot of people saying this, and I think it’s a matter of everyone having had a year to adjust their budgets/spending/whatever. It was amazing to hear EVERYONE saying that last year was a rough one and that 2009 was so much better. I would have liked to have known that last year, having left MD disappointed and thinking it was just us. Too often, we find ourselves living in a bubble, believing that what we’re fearing or feeling is unique to us, when, in reality, our experiences aren’t all that unique at all. But I digress (can’t get too preachy here). From the opening bell on Saturday morning, the show was packed. People were everywhere and you could tell it was going to be a good show. We had our second best sales, breaking three figures, which was nice. 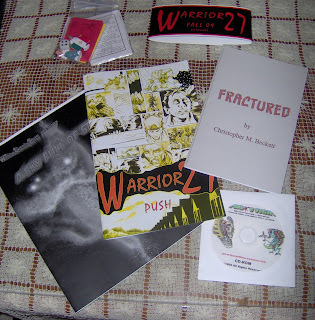 It also felt good to sell at least one copy of everything on the table, including copies of issues 1-4 of WARRIOR27, a copy of the Arcana horror anthology, DARK HORRORS 2, in which Dan had a story published, and a few other things. Like most though, we’re not here to make money. Maybe a little to recoup our initial expenses. But for the most part, the big draw of SPX is getting to catch up with friends like Justin Fox, Mike LaRiccia, and G.B. 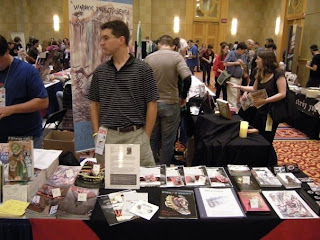 Tran, having an opportunity to talk directly with publishers and editors like Chris Staros at Top Shelf or James Lucas Jones of Oni, and getting to make new friends like Adam Umak, Julian Lytle, and Frank Santoro. It’s a very cool atmosphere and it can really invigorate you. I had a great conversation with Frank Santoro (check out his COLD HEAT series, done with Ben Jones and published by Picturebox) about art and comics and how the whole page works, or can work, in a comic if you’re willing to see things in some way other than just a panel to panel progression. I told him about this mini-comic idea I’ve had burning in the back of my mind for three years now and he’s got me convinced to just go ahead and draw it, which has been the big stumbling block for me. Like he said, Wally Wood and all those masters had swipe files for reference because they needed to be fast and accurate. They would find whatever image they needed, get the perspective and proportion from the picture, and draw it in their own way in order to keep drawing. Utilizing something like that in order to manage the perspective and such of the images, while creating my own style (if I can hope for such a thing with this project) should help me get over this hump. I plan on having COMPARE & CONTRAST at the Expo next year. - Catching up with friends, as mentioned above. -Getting to meet Mr. Phil & Charlito from the Izzer. 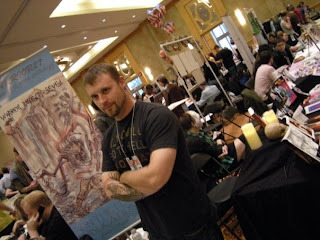 -Talking with Adam Umak from the Legion of Dudes. -Having an opportunity to share a preview of the short story Ape will publish as part of their UFO anthology with Chris Staros, Chris Pitzer, and others. -Getting a chance to see my old buddy from college, who was not around last year. Hey, John. -Meeting online friends for the first time in the flesh, like Sam Costello from the Panel & Pixel Boards, who is the brain behind the Split Lip horror anthology. Check it out. -Finally picking up TO THE HEART OF THE STORM and THE NAME OF THE GAME by Will Eisner for $5 a piece at the CBLDF table. Can't wait to read these. -And having Gahan Wilson check out our books and wish us luck. SPX is over for 2009, and I’m already thinking ahead to next year and what I might have. Not only do I want to have that mini-comic, but I’ve got another idea rolling around that I might try to get done. And, I need to follow up with publishers, reviewers, and others to keep my name out there and see where this little trip will take me.